John has spent the majority of his adult life working in the plumbing industry. In 2009, the company he had been with for years down-sized. Unfortunately, John was one of many let go. Luckily, John had been in the industry for quite some time and met little resistance when it came to being hired on with another plumbing company. John spent about a year at his new employer before they, like the previous employer, cut their staff. This time, it was much tougher for John to find a plumbing job. Most businesses weren’t hiring or looking to grow. So, John hit the road as a truck driver. John drove for two years and saw nearly every part of the country. “Driving was peaceful, but it is not for me. I’ve been working hands on my entire life and I’m not the type who can sit behind a wheel and be comfortable. I want to see the work I’m doing, and plumbing was that,” stated John. John recently decided to quit his driving job in hopes of finding another plumbing job. He has yet to find one and is now forced to be very cautious where to spend the little money he has left. “It’s not that I want to be here, I have to be. I wouldn’t have much to eat otherwise. 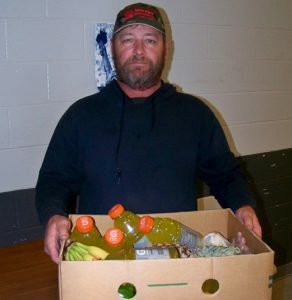 I know many people are in much worse situations than me, so I feel bad that I’m potentially taking food from somebody that may need it more than I,” he said. Contrary to his belief, John’s story is similar to many others standing in line for food. Many are actively looking for work, some are working multiple jobs to make ends meet and too often, it’s simply not enough.